activity with enriching pure botanicals. Enhanced with the active benefits of aromatherapy pure essential oils, Mayella ® Multi Vitamin Enriched Whip has been formulated containing certified organic and bio-active botanicals. A vegan, 100% plantbased daily moisturiser that is suitable for all skin types, women, men and teens. 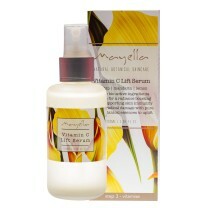 Mayella ® Multi Vitamin Enriched Whip is the supreme regenerative moisturiser. Packed full of concentrated botanical and marine extracts blended with healthy pure plant oils rich in essential fatty acids to deeply nourish and nurture skin cells and the skin matrix for glowing with health, supple and endlessly youthful skin. Essential Fatty Acids (EFA’s = Omega 3 & 6) are necessary for human functions and healthy, youthful skin. Skins lacking in EFA’s may be seen as dry, sensitized, flaking and can be prone to skin conditions such as dermatitis, eczema, psoriasis. If you are allergy prone or tend toward dry or sensitive skin, or autoimmune disorders such as those listed above, using our natural botanical skincare rich in EFA’s daily will be proactive in achieving a healthy, calm, smooth, supple skin that is resilient and youthful. The combination of ancient ingredients in our Mayella ® Multi Vitamin Enriched Whip creates a significantly unique attribute of celebration, a symbolic appreciation of all that is special to be loved and treasured about oneself and the daily ritual of applying your skincare – to love and care for oneself. No ordinary formula, our light in weight enriching whip is the heavy weight superfood of skincare. The Superfood ingredients in Mayella ® Multi Vitamin Enriched Whip provide a rich natural organic source of Vitamins such as A, C, E, K and enzymes such as S.O.D (Superoxide dismutase) providing a protective and restorative action against ageing free radical damage and the trauma of UV damage from sun exposure. The inclusion of Aloe fully supports and unifies healing, quick to absorb properties of the Enriched Whip. Aloe acts as an electrolyte for the skin to effectively hydrate and retain moisture levels. Carrot oil naturally healing and regenerative, has properties which nourish and tonify and firm the skin with benefit of being antiseptic. With its abundant & balanced nutrient properties, Sea Buckthorn promotes skin health, regeneration, hydration, elasticity. Perfect for inflammatory skin conditions such as rosacea, sun burn, blotchy and sensitised skin. Pomegranate is antioxidant rich especially in Vitamin C, with phytonutrient properties that are anti-ageing by way of increasing collagen production and improving elasticity. Naturally protects against sun damage, free radicals and chemical exposure. Mature skins and those tending towards sensitivity, redness, blotchy or irritated skins will benefit immensely from the moisturising, calming properties held by the presence of Pomegranate within our Mayella ® Multi Vitamin Enriched Whip. Marine Polyphenols in Mayella Multi Vitamin Enriched Whip stimulate immunity and protect the very building blocks of our skin. These unique marine polyphenols are high in powerful antioxidants and target the preservation of collagen and elastin fibres to improve skin tightness, firmness and smoothness. Our marine extracts effectively brighten and balance uneven pigmentation, working on a cellular level to create a glow that comes from within. The gentle formulation will address the variety of skin conditions an individual will experience from day to day and lifestyle. Whether it be externally as in the environmental influences one encounters or more internal changes such as relating to symptoms of monthly menstrual cycle such as break out, or allergies and sensitivities expressed as irritation, redness, dryness of skin. Simply by combining and layering Mayella Multi Vitamin Enriched Whip with our Olivane Repair Serum infusions or a particular Vitamin Serum, you can individually address any concerns that may come at any time and especially seasonally. Our 5 step daily ritual supports and allows you to overcome and heal, responding to your skin’s expression with its anti-inflammatory, antiseptic and hydrating properties and to balance, correct, support, regulate, regenerate. Even though it is high in healthy plant oils and omega’s, the texture of Mayella Multi Vtamin Enriched Whip is light and fine, absorbing quickly leaving no film or feeling of greasiness. Such is the Alchemy of our formulation. Skin will look and feel moist, hydrated and smooth with daily application directly onto clean skin for quick absorption followed by your Vitamin Serum or Lotion for intensified antioxidant therapy. Mayella ® Multi Vitamin Enriched Whip is the skinfood primer for your daily skin care routine. Shake bottle well and disperse 1–2 pump of Mayella ® Multi Vitamin Enriched Whip onto clean dry hands. Press whip onto your whole face and neck, massaging in gently with an upward outward circular motion. Face and neck will be left feeling enriched, protected and completely nourished. Store i a cool dry place below 30°C / 86°F. Pure Carrot* – Healing, regenerative, tonifies and offers antiseptic properties.